This tool will look great on the top of your desk. A floating globe. It sounds interesting. You may think that it's suspended by an invisible wire, but it's not. It is actually suspended by an impressive electronically controlled magnetic system. 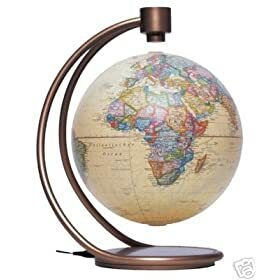 With an 8" diameter, the globe displays a highly detailed map of the entire world. It has a magnetic field sensor which records the magnetic field generated by the permanent magnets situated in the globe sphere and transmits this to the computer. The computer analyses the received data, controlling the electronic magnets so that the sphere moves accurately upwards or downwards. When the suspension mechanism is turned off, there is a permanent magnet in the base which holds the sphere safely on the frame. You can buy the globe from HERE for the price of $90.